I reviewed the specifics of the Baby Trend Expedition Double Jogger Stroller. For the price and what you get, it is worth considering. However, this is not a performance running stroller despite the name. The Baby Trend Expedition Double Jogger Stroller is designed for children aged from 6 months to 50 pounds (each). It has multi-position seats that recline. The rear tire is 16 inches and the front tire is 12 inches. All tires are rubber pneumatic all terrain bicycle tires. The front tires swivel and lock by using a foot-activated pedal. The storage basket underneath the seats is large. The dimensions of the stroller are 31 ½ inches wide by 46 inches in length. The weight of the stroller is 32 pounds. Now, let's take a closer look at each item. The three wheel set up is going to maneuver and get you around to where you're going much faster and easier than any type of stroller with more than 3 wheels. That's just plain and simple. But with this system, that means that the two children will be sitting next to each other instead of riding tandem (one in front of the other). Tandem strollers are going to fit into doorways and narrow places much easier than side by side strollers with just 3 wheels. You need to decide what is more important to you. Either getting into tight places easier with a tandem, or getting around quicker with the 3 wheel set up of this Baby Trend Double Jogger Stroller. Customers who bought and reviewed this stroller who used it just for walking, loved the wheels and said it pushed around like a breeze. This stroller is also one that the company says in the title that you could run with. However, without a handbrake, I do think it would be much more difficult to run with than other running strollers. 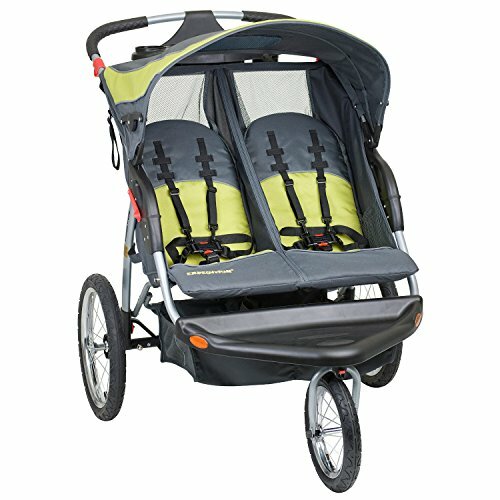 Competitor runners also commented in the reviews that this stroller wasn't built the best for running. Parents who used this stroller said it gets around great on dirt roads. Many of the other competitor strollers that had more than 3 wheels were hard to push and turn, especially on dirt roads or bumpy surfaces. The canopy is nice and large. It will block your children from the sun and rain. You can also buy a rain cover separately if you'd like. I used my rain cover many times (a different stroller brand, but similar rain cover) to not only block the rain from my child, but also the wind. If you will be out in not so perfect weather with your children, then I'd recommend buying the rain cover. It really is worth it when you need it. Parents who purchased and used this stroller really like how the canopy would go all the way back or all the way in front of their children to block the sun. This is especially nice when the sun is right in their faces as you walk or run forward. Simply adjust the canopy down in front to shade your kids completely. A drawback of the canopy is that it works as one piece not independently for each child. Both seats have a 5 point harness system. This is a great safety feature to keep your little ones snug in their seats. The seats also recline independently which is nice in case one child is sleeping and would like to recline back, while the other may be awake and want sit up. Both seats can be reclined to the point of where both seats lay completely flat. The Baby Trend Expedition Double Jogger Stroller is not designed to hold an infant car seat. It's simply not made to safely hold one. To some who like to snap in car seats, this is a disadvantage because you can't do that. A common complaint about the seats were that the children rolled to the center next to each other. Some said they could live with this disadvantage, while others said that the company should make a sturdier backside so that this wouldn't happen. For what you get, this stroller is a great price. It maneuvers better than other tandem strollers, and has a lot of great qualities without the hefty price tag. If you are just wanting to walk, and walk efficiently, this stroller will get you around nicely. The Baby Trend Expedition Double Jogger Stroller folds down easily. However, a common complaint was that even when folded down it took up a lot of room. It is worth noting, however, that most of the same parents that said the big size was a draw back, commented that the stroller had enough other good qualities that they could live with this disadvantage. Keep in mind that many doubles are huge even when folded, so The Baby Trend Expedition Double Jogger Stroller is no exception. Above the canopy are two cup holders for the parents. However there are not cup holders for the riders. Some parents like to keep their childrens' sippy cups up with them by the canopy and then just hand it to their children as they want a drink. So this may or may not be a problem for you. This stroller does have a safety strap that you can put around your wrist. This is a nice safety feature since The Baby Trend Expedition Double Jogger Stroller doesn't have a hand held brake system. This stroller gets around much better than many of the other strollers I have reviewed. I like the 3 wheel system. However, it would have been even nicer had this stroller been made with bigger wheels. This is not a performance stroller (for the running mom or dad) so I had to keep that in mind. But, I still wish this stroller had a hand held brake system so it would be safer for the parent who would like to walk down hills with it. It simply would not be safe to go down a hill without slowing completely down, since it has no hand brake. Being a running mom, and with this stroller being called a jogger stroller, I wanted to know how it stacked up with performance running strollers. Most runners said to not get this stroller for running. The front wheels lock up and are hard to turn. One runner called customer service and was told to not run with this stroller. Other runners said it collapsed on them when trying to run faster. From the look at how this is designed (small wheels and no hand brake) and hearing from running parents, do not get this stroller for running with your children. Get it for the other reasons though if it fits your budget and needs. If you are looking for an inexpensive stroller that will maneuver reasonably well, then this stroller is worth a consideration. It will push much easier than the tandem strollers, and it also gets around well on rough terrain. To read our full review on the top ten double strollers of 2018, check out our article here.